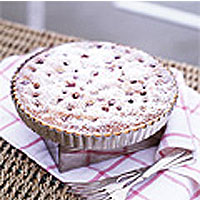 You will need a 22cm-diameter, 4cm-deep tart tin or dish. If making your own pastry, sift the flour and salt into a bowl or food processor. Rub the butter in, either using your fingertips or whizzing in quick bursts, until it forms fine crumbs. If in a processor, tip into a bowl. Put the egg yolk in a measuring jug and add enough cold water to reach 100ml. Mix into the flour mixture and, as soon as it begins to bind together as a dough, turn out. Lightly knead until smooth, then wrap in foil or greaseproof and chill for 30 minutes. Preheat the oven to 180°C/gas 4. Roll out the pastry into a large circle and loosely wrap around the rolling pin. Hold it over the tart dish and carefully unroll, gently pressing the pastry into place. Prick the bottom with a fork, press some aluminium foil or greaseproof paper into the middle, and fill with pastry weights or rice before chilling for 30 minutes. Bake blind for 20 minutes and remove the weighted foil. Reduce the oven temperature to 170°C/gas 3. Meanwhile, de-stalk and stone the cherries. Set aside while you quickly make the filling. Beat together the butter, sugar and orange zest until pale and fluffy, then gradually add the eggs. Finally, beat in the sifted flour, followed by the almonds. Spread the almond paste into the tart, then push the cherries into the paste. Bake in the centre of the oven for 35-40 minutes until slightly risen and golden. Cool then dust with icing sugar. Serve with crème fraîche.